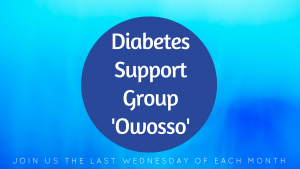 JOIN US FOR OUR DIABETES SUPPORT GROUP These support groups are for individuals, family members and caregivers who deal with Type 2 diabetes. There is no cost or registration for attending. For either group, call (989) 729-4712 with any questions.